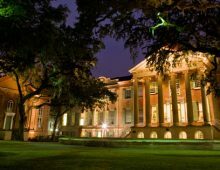 The following message from the College of Charleston Helpdesk to the campus community provides detailed instructions for ensuring that faculty, staff and students receive future CougarAlert notifications. 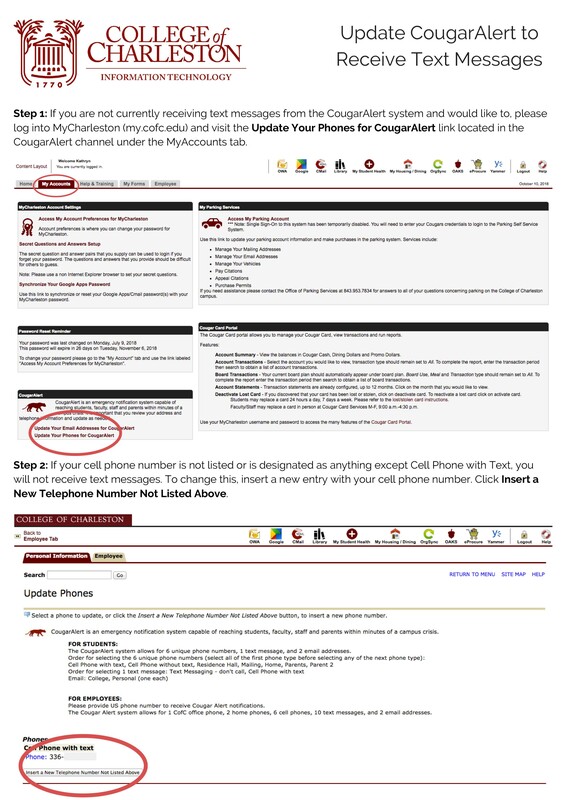 As College leadership continues to monitor and prepare for potential inclement weather from Hurricane Michael, and to ensure that you receive future CougarAlert notifications by your preferred method, we ask that you please log into MyCharleston and review your CougarAlert settings. CougarAlert is the emergency notification system the College uses to send important information to students, faculty, staff and parents. 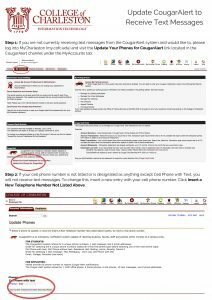 If you are not currently receiving text messages from the CougarAlert system and would like to, please visit the ‘Update Your Phones for CougarAlert’ link located in the CougarAlert channel under the MyAccounts tab in MyCharleston (see instructions at right). If your cell phone number is not listed or is designated as anything except “Cell Phone with Text,” you will not receive text messages. If you have questions or concerns, you can reach the Helpdesk by phone at 843.953.3375 or through the portal at https://help.cofc.edu/.